The absolute warmest jeans you've ever worn - lined with 100% cotton fleece to lock out the cold! 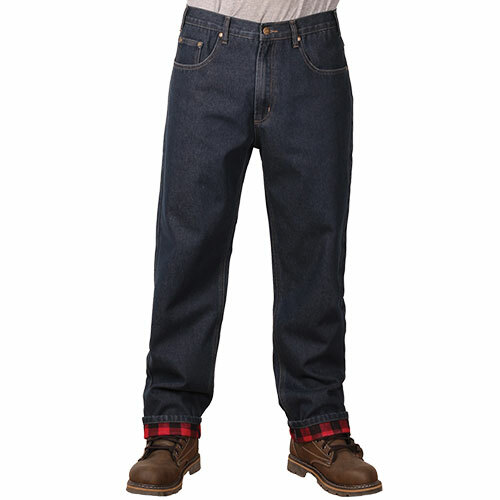 These handsome Outback Rider jeans are crafted from 100% cotton denim & lined with 100% cotton Buffalo plaid flannel for warmth and wind-blocking comfort you won't get from ordinary jeans. They breathe to help control moisture too. Also features quality seams, straight leg, belt loops, two front, two back and one change pockets. Relaxed fit is perfect for working around the yard, shoveling snow, hunting & more. Color: Blue/red/buffalo plaid. Mens size 42x32.